Kaitlin McFarland | American Forest Management Inc.
Kaitlin McFarland is a licensed real estate broker for the land sales division of American Forest Management. 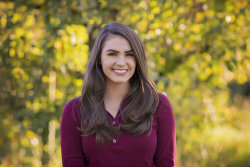 Since September of 2018, Kaitlin has specialized in the buying and selling process for timberland, resource and farm/ranch properties in Washington State. Her own desire to invest in the land brought her to American Forest Management; under the guidance of Mark Skillman, she has developed a blossoming career. Kaitlin has a love for the land in Washington and is a ready hike, photograph and list properties ranging from big to small. She can provide her clients with broker’s opinion of value, HBU (Highest Best Use), as well as, help them navigate the often challenging circumstances of real estate transactions. As a child, Kaitlin spent time with her father in North Carolina hunting, fishing, hiking and camping which is where her passion for the outdoors began. Since relocating to the Pacific Northwest her talents for all things outdoors have continued to develop. With her studies at Brigham Young University - Idaho and experience within resource management she is ready to bring her love of the outdoors to work with her and share that passion with her clients.